This time last year the Custom PC/bit-tech folding team set itself the challenge of adding an additional 360 GPUs to our combined effort to contribute work to the distributed-computing project folding@home. We're pleased to announce that, almost exactly a year to the day, we've met that target - so a big congratulations is in order for everyone who increased their contribution. 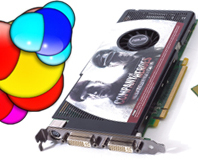 Forum regular Nova was the last user to add to the countdown with the addition of two GeForce 8800 GTS - well done! The team isn't standing still though - there are still plenty of proteins to be folded, so we've set ourselves a new goal - 750 more GPUs. This number has been chosen as this is how many additional GPUs that the team will require to close the gap with the current number 1 team and move up from our current world ranking of 6. To sign up your GPUs (or CPUs and PS3s, all are welcome) to the cause make sure to enter '35947' in the team name field of your folding clients, which you can download from Stanford University - the creators of folding@home. 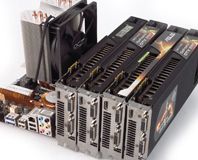 Once setup don't forget to add your new GPUs to the all new countdown thread. Don't forget to say hello in the dedicated folding forum too.